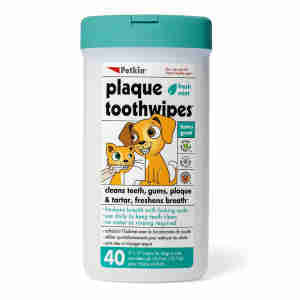 Petkin ToothWipes for Cats & Dogs are the easiest way to ensure your pet has good dental health at all times. Made using a blend of baking soda and fresh mint flavouring, these simple wipes are fantastic for the daily cleaning of your cat or dog's teeth and gums. By making sure your pet's teeth are clean and fresh, you can help fight off plaque build-up and gum disease. 40 wipes in each pack. Baking Soda, Cetylpyridinium Chloride, Mint Flavour. Before First Use: Remove lid. Pull one wipe from center of roll and thread through opening in lid. (Caution: Do not push ﬁnger through opening.) Replace lid. Directions: Pull wipe up and tear at slight angle. Wrap wipe around index ﬁnger. Open pet’s mouth and gently rub several teeth at a time until all are clean. Be patient, as some pets may resist cleaning at ﬁrst. Use additional wipes as necessary. No water or rinsing required. ALWAYS USE CAUTION when working in or around pet’s mouth to avoid biting. Not for child use.